The move came after two key Republicans, Sens. Jeff Flake and Susan Collins, consulted with the White House to insure the FBI probe would be thorough. WASHINGTON — The White House on Monday eased some of the limits it had placed on the FBI investigation into sexual assault allegations against Supreme Court nominee Brett Kavanaugh, authorizing the FBI to interview whoever agents thought was necessary, a senior U.S. official and another well-placed source told NBC News. The move came after two key Republican senators, Jeff Flake and Susan Collins, consulted with the White House counsel's office to insure that the FBI investigation would be thorough, both senators said. "It does no good to have an investigation that just gives us more cover," Flake said at an event in Boston, moments before the New York Times first reported the White House decision. FBI officials said they could not comment. The White House action came after President Donald Trump made a series of misleading statements in which he suggested that the FBI was free to talk to any witness deemed relevant, when in fact, as NBC News first reported Saturday, there were significant restrictions placed on the FBI. After consulting with Senate Republicans, the White House instructed the FBI to interview just four people — Kavanaugh friends Mark Judge and P.J. 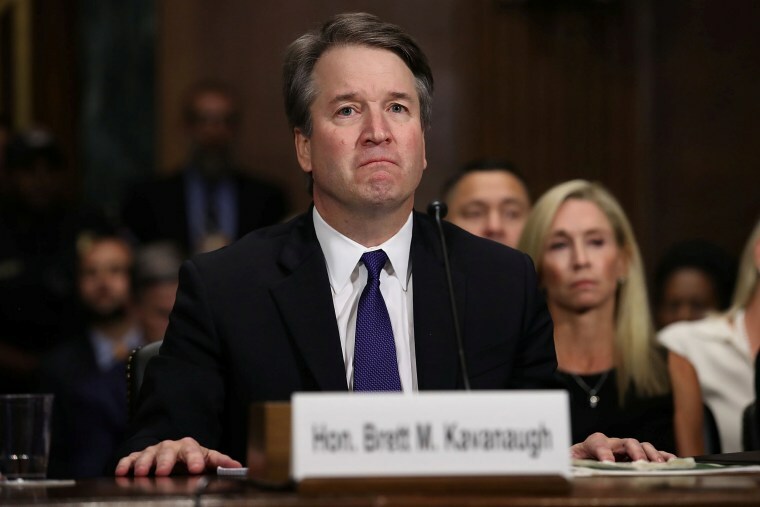 Smyth; accuser Deborah Ramirez, who says Kavanaugh exposed himself to her while they were both students at Yale; and Leland Keyser, a friend of Christine Blasey Ford, who has accused Kavanaugh of sexually assaulting her when she was 15. Smyth's lawyer told NBC News Monday he "truthfully answered every question the FBI asked him and, consistent with the information he previously provided to the Senate Judiciary Committee, he indicated that he has no knowledge of the small party or gathering described by Dr. Christine Blasey Ford nor does he have any knowledge of the allegations of improper conduct she has leveled against Brett Kavanaugh." NBC News also confirmed that the FBI has spoken to Judge and Ramirez. But until the policy change Monday, the FBI had been forbidden, sources told NBC News, from taking basic investigative steps and from following up with possible corroborating witnesses. Nor were agents authorized to interview Julie Swetnick, who has accused Kavanaugh of sexual misconduct while he was in high school. Still unclear is whether the FBI under the new guidance will be able to examine the dispute over Kavanaugh's drinking at Yale. Several former classmates have emerged to say that the judge minimized his drinking in his Senate testimony. That could be relevant to the issue of whether he committed sexual misconduct while drunk, critics say. Another open question is whether the FBI will seek to determine whether Kavanaugh lied to the Senate about references in his yearbook that many believe were sexual, but he said were not.